At the start of the year, Ontario’s minimum wage increased from $11.40 to $14 per hour. The previous government led by Kathleen Wynne planned another increase to $15 on January 1, 2019. Premier Doug Ford’s new Progressive Conservative government, however, will not implement this hike. Andrea Horwath, the leader of the official Opposition, accused Premier Ford of catering to big business, while various unions reiterated long-stated views that higher minimum wages help lift people out of poverty. The evidence, however, suggests otherwise. There’s precious little evidence to support such claims, that raising the minimum wage actually has a measurable effect in reducing poverty in Canada. While this critically important question has not been studied as much as the link between minimum wages and employment (more on that later), several studies have in fact tackled the question. And again, the research generally provides no support for minimum wages as an effective anti-poverty tool. This result might seem counterintuitive, but there’s a simple explanation. Minimum wages don’t significantly reduce poverty largely because the vast majority of minimum wage workers don’t live in low-income household. Instead, they are primarily secondary earners (often teenagers) living in families that aren’t poor. So even if there were no negative effects on employment (more on that in moment, too), raising the minimum wage another dollar would not effectively alleviate poverty largely because much of the extra labour income would flow to households that aren’t poor. The evidence in Canada clearly shows, however, significant negative employment effects. Holding all else equal, higher minimum wages mean fewer jobs (specifically, for young people). There are a range of estimates of “effect size,” from modest to large, but according to the Canadian evidence, raising the minimum wage tends to decrease employment levels over time by making it more expensive for businesses to hire. This of course makes it harder for young people to land a first job and start building the skills, experience and references needed to eventually secure higher-wage positions. 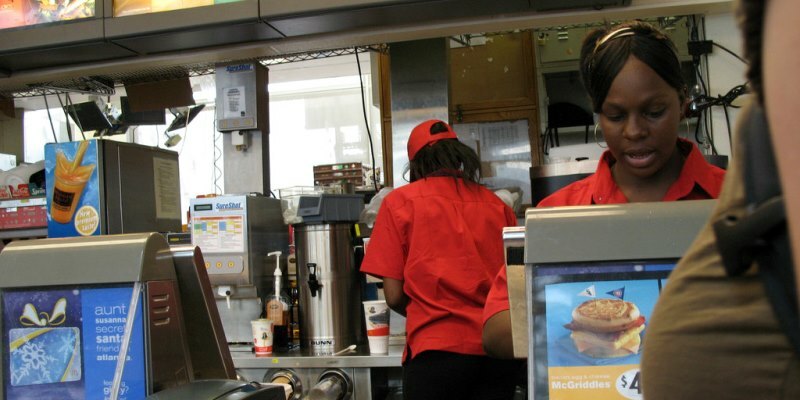 So why do policymakers and activists continue to call for minimum wage hikes? The politics of freezing the minimum wage are often difficult, partly because the positive effects (higher hourly wages for some workers) are highly visible whereas it’s harder to pinpoint the individuals bearing the costs. For example, if a restaurant decides not to hire one additional wait staff member because a higher minimum wage makes it too expensive, the young man or woman who would have received that job is impossible to identify since nobody was actually hired. Situations with highly-visible benefits, but less-visible costs, often produce suboptimal public policy. Any successful government must make politically difficult decisions. The Ford government deserves credit for taking an evidence-based approach to this dimension of labour policy by cancelling a second minimum wage increase, which would have made it harder for businesses to thrive and for young, less-skilled Ontarians to reach the first rung on the employment ladder. If you’re looking for a science-based approach to public policy, certainly a laudable goal, you should probably first look at the research.